Something unusual happened over the last few weeks. Well, besides St. David’s taking back the Eastern Counties Cup from Cleveland County in dramatic nail biting style. For an entire week, Bermudians’ Facebook timelines became flooded with accolades by the hundreds, if not thousands, by persons of all demographics giving praises to a small set of young Bermudians who had worked tirelessly over the last few months pooling their skills and crafts together to produce a flawless production of the award winning movie and Broadway play The Colour Purple. Such was the demand that even with three extra shows being put on, the seats were sold out faster than spots on Front Street for the 24th of May Parade. Entire families were purchasing up to four and five tickets at a time. To my knowledge, never before has a local production been held over by popular demand for three additional performances. With all that being said, much thanks has to be given to everyone involved with the production, from the stage hands, costume makers, makeup artist, directors and the performers themselves. What they were able to achieve has effectively reset the dial in multiple ways: First and foremost they completely destroyed the false notion that young Bermudians simply sit around and expect handouts without being willing to get out there and utilize their God given talents to uplift themselves and others around them. Secondly, they firmly and without a doubt demonstrated that Bermudians are multi-talented performers. Whether it be singing, acting or musical performances, there is no doubt that these young persons delivered on a Broadway level. Essentially there is can be no question about whether or not our people are able to entertain locals and our visitors. Zip, zero, none. 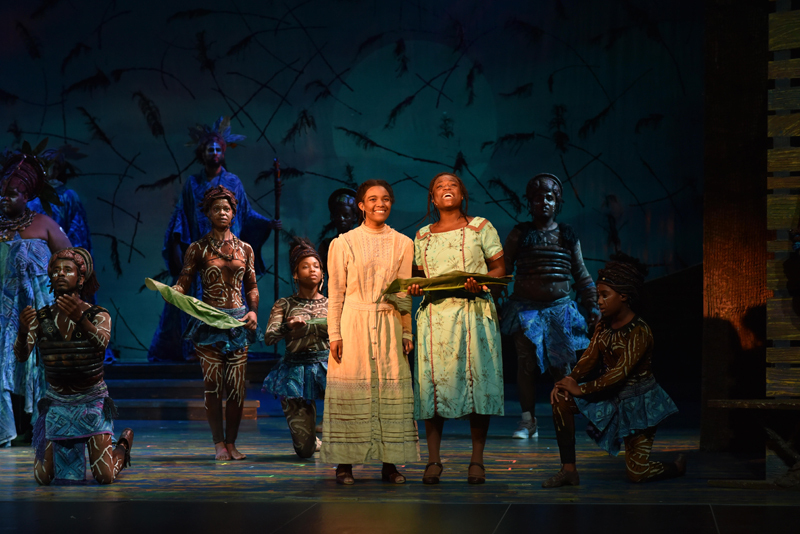 This production has now given the next generation of Bermudian performers the bar to which they must strive and show that they are worthy of performing in their own island. Thirdly, these young people provided a valuable lesson for the entire island. Often the cry from politicians, clergy, and unions is for Bermudians to get together and work for a common good, Unfortunately, far too often that cry is never answered. The cast of The Colour Purple answered that call and went on to exhibit unity through the arts. 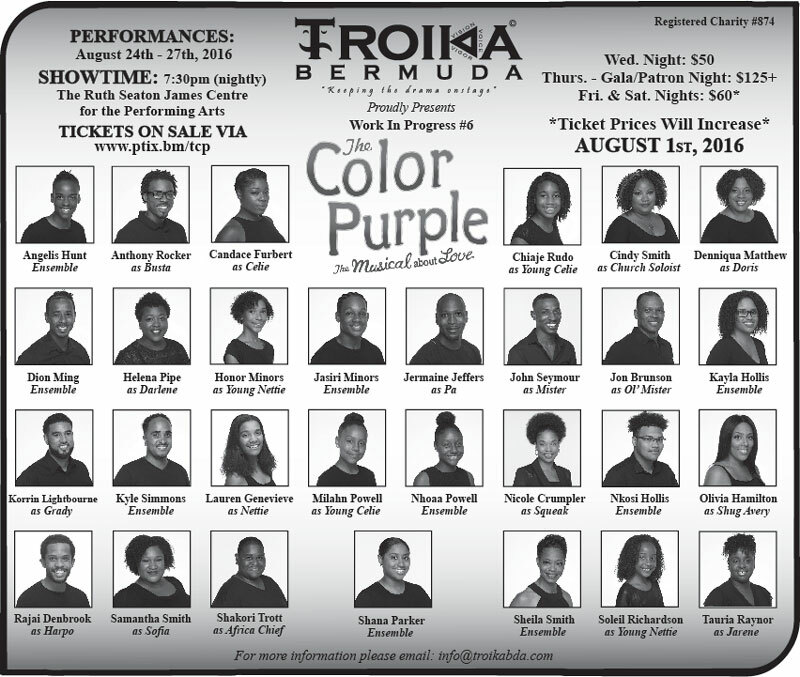 Numerically speaking, about 3,000 persons got to witness Trioka’s production of The Color Purple. However, the entire island got to witness the long term results of the efforts of these young Bermudians. For this we must say thank you, Trioka. Definitely the best local production we have seen. Excellent. An excellent summary. The entire production was simply fantastic. We really need to promote our local theater as a tourist product and I am hoping that the Department considers this. You would not pay the Bermuda price of this very much Broadway production in the states it would be more expensive. This production amongst others could easily be part of the Bermuda Festival as well. Congratulations Troika! Well done. The Rawlins Clan, had a Reunion the weekend of August 6 and 7. The family tree included descendants of sisters and brothers/male cousins who made their way from Nevis, B.W.I. to Bermuda in late 1800s – early 1900s. The descendants are Browns, Hendricksons, Dasents, Jeffers, Grants and Rawlins. 3. Precious Perinchief, Spot Operations, Production Team – (Hendrickson/Adams) Family – currently business student, et al. With the few “wrong” and “impactful” things that are going on with our young people and Bermuda, there is a ‘huge” and yet to be felt amount of things that are “right” and “impressive” with our young people and Bermuda. Troika’s Color Purple made that impact. C.D. I cannot agree with your comment about our young people more. I so appreciate knowing a few in the cast. I experienced last night was also a fantastic celebration of our Bermudian family. The cast and the entire production crew have clearly become a wonderful family through their great work together! Such a great example for all !!! The raw talents and evolving skills that many, many, many of our young people are sharing with us in virtually every sphere in Bermuda are very exciting. My prayer will continue to be that they find their places to thrive in their homeland, Bermuda, and/ or ‎ in others places they may choose on this globe which is so in need of inspiration. God truly is at work in and through them; and I am so very grateful to be touched by them, even as I hope to bless them too for Him. J.M. Congrats to the Troika team, the actors and producers. Outstanding!!!!!!!! !